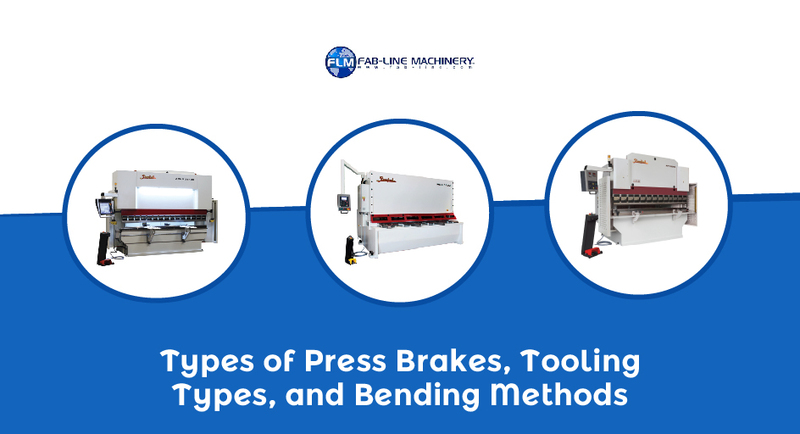 Press brake operators require a detailed understanding of their machines to successfully bend materials. Here is key information on the two different types of brakes, toolings, and bending methods used with press brakes. There are two primary types of press brakes: hydraulic and electronic. Hydraulic press brakes are the oldest press brakes and as such are more common than their electronic counterparts. Hydraulic press brakes can handle the heaviest workloads. While 100-300 tons is the commonly found tonnage, they have been manufactured in sizes up to 3000 tons and 50 feet in length. Electronic press brakes are less common than hydraulic press brakes as they are newer to the scene. However, they offer many features not found in hydraulic brakes. Being completely electronic, there is no need for hydraulic oil and therefore no oil leaks. Operating costs are further reduced as energy needs are lower, because motors are not continuously run. Electric brakes tend to be more accurate, quicker, and smaller in size coming in under 50 tons, although machines can range in sizes up to 300 tons. Tooling tolerances should be checked each time a punch and die are selected to use. Ensuring the tooling fits the manufacturer’s specifications is the operator’s responsibility, as well as making adjustments when necessary. Rocker-Type Dies: These dies bend metal by moving up-and-down and side-to-side. Gooseneck Dies: Used to clear rims that protrude from workpieces also known as flanges. V-Dies: Used for creating v-shaped bends. Acute-Angle Dies: Used to create acute, obtuse, and right angles. Seaming Dies: Create seams in sheets and tubes. Multiple Bend Dies: Made to form specific shapes. Depending on the project, these dies can form several bends in one motion. Curling Dies: Used to curl and coil the edges of sheets. Offset Dies: Punch and die sets that create two angles with a “Z” shape. Air Bending: In this method, the workpiece will come into contact with only the edge of the die and the tip of the punch. The punch is actually forced past the top of the die into the V-opening without coming into contact with the bottom of the V. The inside radius of the bend will be controlled by the size of the V-opening of the bottom of the die, since the punch tip does not penetrate the workpiece. Bottom dies can be switched by the operator to compensate for mistakes or tweak the design. Air Bending is typically not done on older, mechanical machines. Bottom Bending: In this method, die angles should match the intended angle of the workpiece. After the workpiece is bottomed against the die, the radius of the punch is forced into the piece, which creates the angle. Releasing will let the material spring back to meet the die again. Remember to over-bend the material a few degrees to account for springback. Coining: This bending method involves stamping the workpiece between a punch and a die. The right amount of pressure will allow the punch tip to penetrate and flow into the material. This method is accurate, highly repeatable, and is achievable with older machines.